A call from someone asking me about Dholes refreshed my memories from Bandipur. Dug my archive and got this image. I just loved it, not sure what others think. This one shot on my old Canon 55-250mm IS lens. I shouldn’t have sold it! I uploaded the image above from home last night. I altered my usual workflow from using Canon DPP to using Adobe Camera RAW. I did not realize that the color profile or color gamut was Adobe RGB. The image looked good in photoshop. When I checked this from office now, I found it to be dull. And I instatnly knew what was wrong. The reason for this is that though Adobe RGB has a bigger color space or wider gamut, the web browsers support only sRGB profile. So, for all your web display use sRGB and when you wish to get your images printed, use the color profile of the printer. A default color profile will not give the colors as it looked on your monitor when you processed. This is the pattern I had in mind when I thought of Bandhavgarh. Unmistakably, the burning bright tiger. 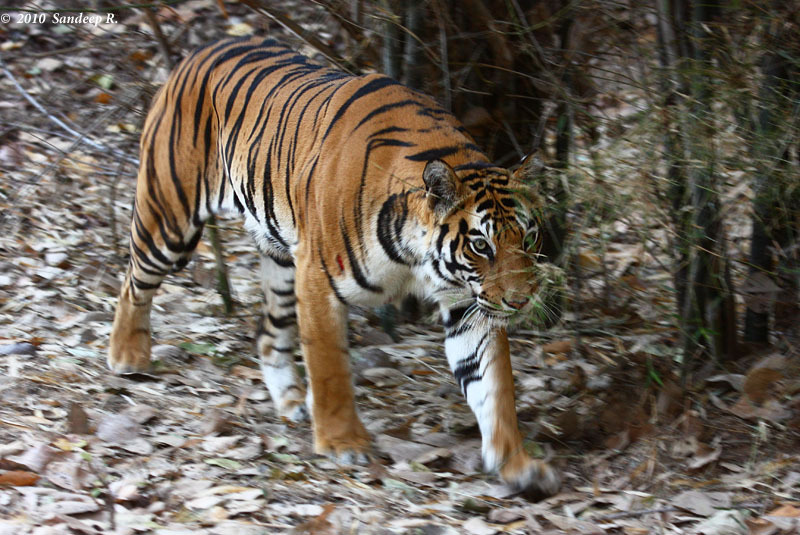 Bandhavgarh was not on top of my list of places to photograph tigers. Bandipur, and more realistically, Ranthambore, were the places on my mind. 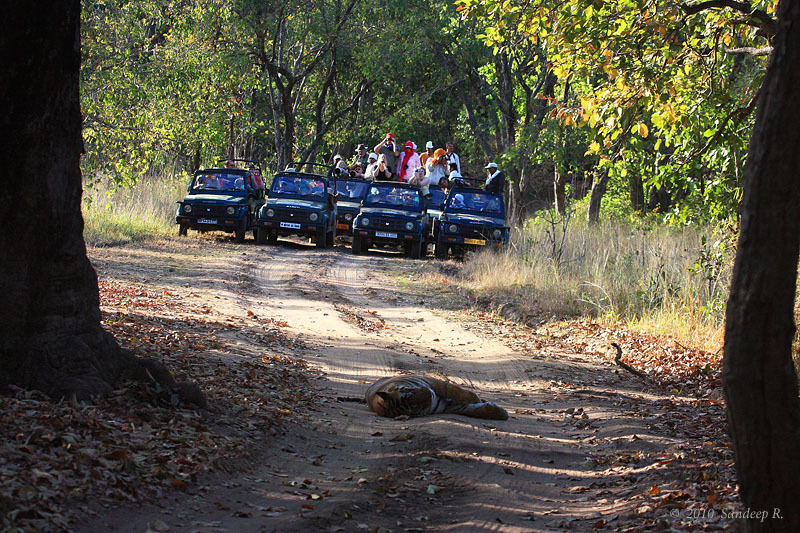 But when Butch was offering safaris at Bandhavgarh, the temptation was too hard to resist. 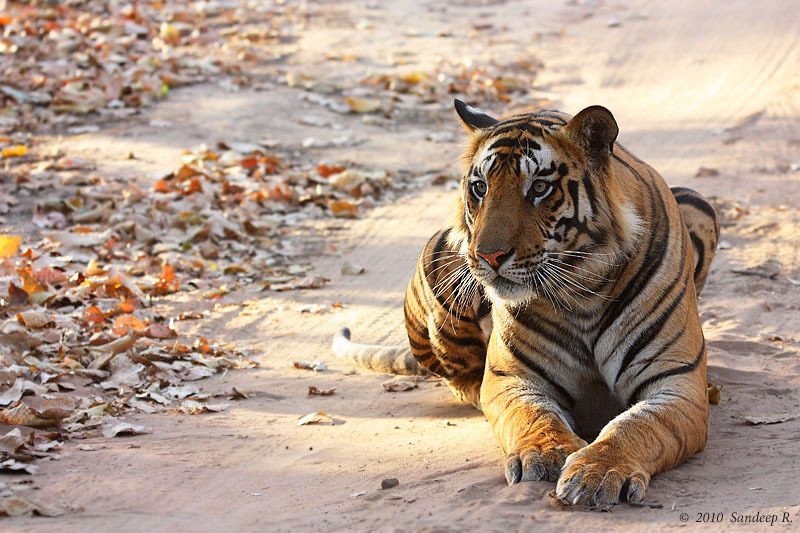 Butch is one of very very few people who know tigers at Bandhavgarh like their own pets. I had seen his photographs and was well aware of his knowledge. My joy was boundless when I got the opportunity to photograph tigers with him and I jumped at it. 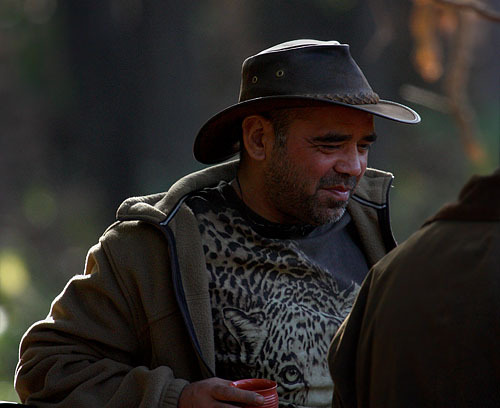 More than a wildlife photographer and naturalist, Butch Lama as a person was great to be with. My images and this post is dedicated to him. Enduring a 36 hour train journey, we (Arun and I) reached Katni at 10:30pm along with another Arun (who joined from Chennai). An Innova awaited us at the Katni station. On the way to our accommodation at Bandhavgarh National park, we saw Chitals and jungle cats. The excitement to see the big cat was mounting. Settled into modest accommodation at Gitanjali. In the morning met Tabish and Himanshu. We were all raring to go for the morning safari. My first of eight safaris. Ten minutes into the first safari, we saw a huge male tiger walking into the bushes, away from the crowd of jeeps. He looked ominous and walked majestically. I just enjoyed the sight. I did not bother to pick my camera up. I knew i’ll get many tigers to photograph here. 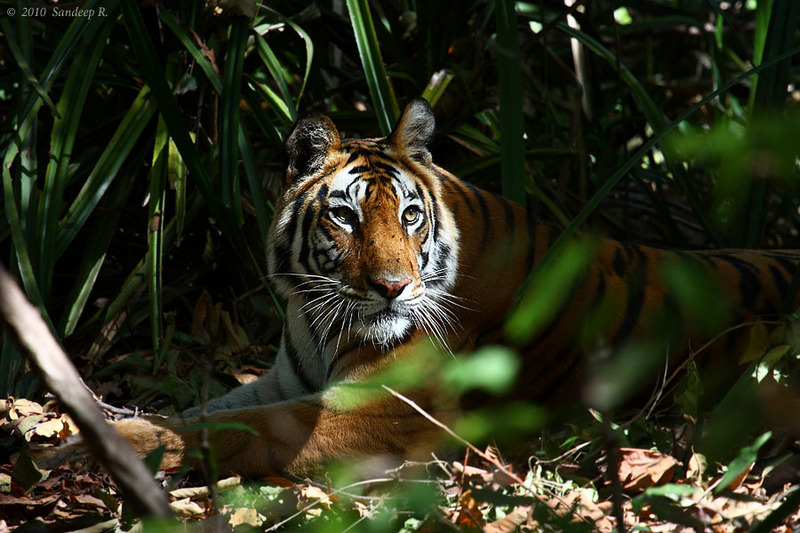 Bandhavgarh is known for tigers. But I was proved wrong in the next 4 safaris. Before the first safari, waiting for the park entry gates at Tala zone to open, we saw an image of a tiger dragging its kill of a deer across the road on a British lady’s P&S camera. This and all those fantastic images of tigers from Bandhavgarh had set my expectation very high and I was bound to get disappointed for the majority of the safaris. Information from those who visited Magdhi zone in the morning safari gave location of Mahaman tigeress and her cubs. All the excited tourists and wildlife photographers descended at Magdhi, the lesser preferred zone of the park. The plan for the evening was to wait at a spot that the tigers need to take to reach a waterhole. There were about 10 jeeps. Two hours passed. Not a sight. Butch moved the jeep around, and Mohan Singh made a brilliant spotting of the tiger cubs. It took good 10 minutes to convince us there was a tiger. The cubs lay hidden amidst the bushes, waiting for their mother to return. She had perhaps gone to make a kill, a guess from the alarm calls heard from far end of the park. No photographs again. And we were the only ones to even see a tiger, including the ones that visited Tala zone. Later at night, Butch put up a slide show of some of his collection of tiger photographs, and other mammals, and birds such as Heynah, Caracal, Hornbill, Barasingha, Dholes and Leopard that found in Bandhavgarh. We weren’t lucky to see any. Eagles, and Adjutants. On way back from centre point, saw a jackal that was picking scent and moving weirdly. 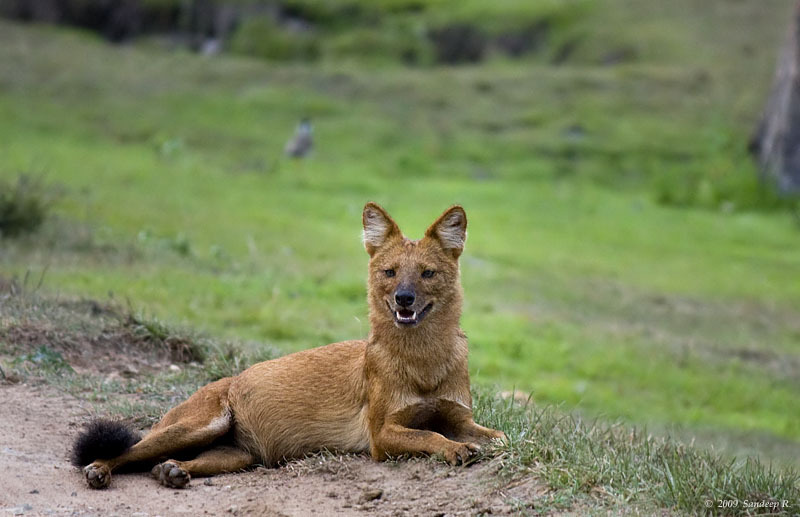 Nearly 3 safaris without much action, we were excited to photograph the jackal in close range. As the jackal moved further, Bokha, the huge male tiger, guarding his kill got up momentarily. This was enough to chase the jackal away. Just a bare glimpse of the tiger. Nothing to be seen once he sat down in the meadow. Drive around the park. Waited for some time at the place we had seen Bokha in the morning. Then, expectant wait in old A route for Chorbera tigress and her cubs. She had killed a cow that just outside the hotel we stayed on the same night we arrived. No luck. I was cursing my terrible luck. 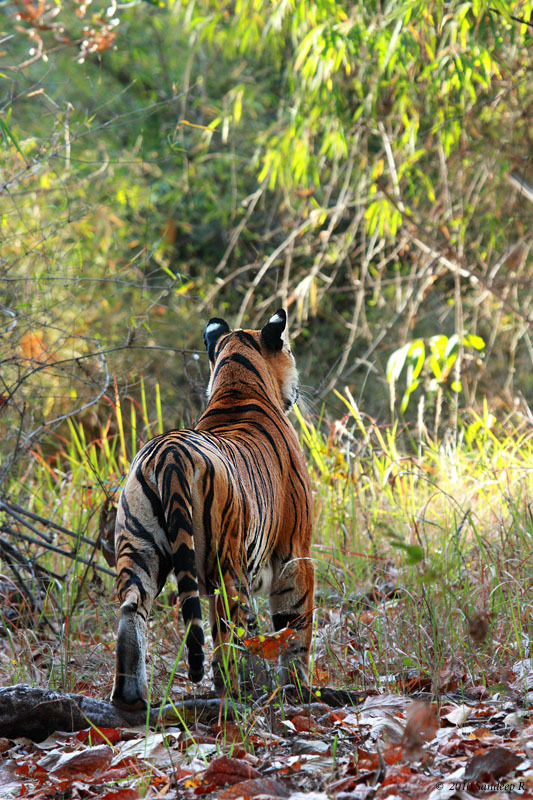 What are the chances that you’ll get back from Bandhavgarh without tiger photographs! Fortunately I hadn’t planned for 4 or 5 safaris, I had 7 chances! Although only 3 more now. News was abuzz that Kallu, Chorbera and her cubs had a feast on the cow and had finished the quarry. Good chance to sight them in this safari was the buzz. But no luck, almost until the end of the safari when we caught the magnificent Chorbera tigress. She was already hounded by 7-8 jeeps. Within a couple of minutes of us arriving, she left the spot limping away into thickets of bushes. But I got that one shot I was content with! I would go back home without any regrets. Incredible drive. The view of Seshshaiya, the fort, and the temple were all fantastic. I probably enjoyed it more since I had got at least one photograph of the tiger. Sighting of long billed vultures glide past us at eye-level was fantastic. A peregrine falcon also made appearance. The harsh afternoon sun didn’t get good images. And no tigers to be seen either. Reached center point on route C, without much action. Gypsy was giving some trouble. Returning on another route, there were 4-5 jeeps on road. A guide from one of the jeep waved at us. Did a tiger just corss the road? Did we miss something? No. Kallu, the young male tiger, is sleeping on the road. He did not give a damn for anybody! From the other side, 2 jeeps arrived. 3 jeeps after a while, then 4, and then 5 and 6. But Kallu did not budge. We learnt that he walked from a waterhole and slept in the middle of the jeep track. There were about 8 to 9 jeeps on either side, but he did not mind. He was fully fed and had quenched his thrist. All he wanted was some sleep, nut the pesky tourists wouldn’t let him take a late afternoon nap! He rolled from one side to another like a child. Jeeps from the other side left after getting close to him. It was getting late and the jeeps had to leave. We got closer. He got up for a moment and seeing us stop, he slept again. 3 Jeeps on the front line started and inched closer. He sprang up and sat down as seen in the image. The audacity was simply amazing. 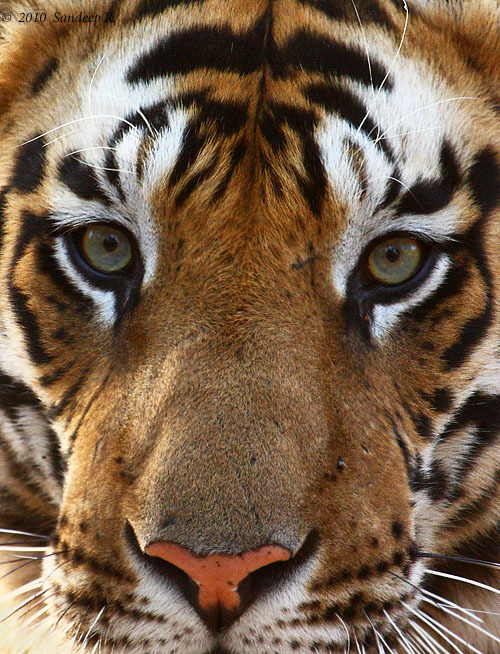 I was sitting on the bonnet of the jeep and at about 12 feet from a huge male tiger. Waiting patiently for every little move and ‘right action’, not wanting to burn up gigabytes of memory with similar images. As the jeeps got closer, he got more stern. The eye contact was simply brilliant. I was little scared that he might charge. I was advised to get back into the jeep, and promptly did. The jeeps closed in, and he moved to the side and walked into the grassy meadows and settled down. Close to an hour sighting. Face to face! 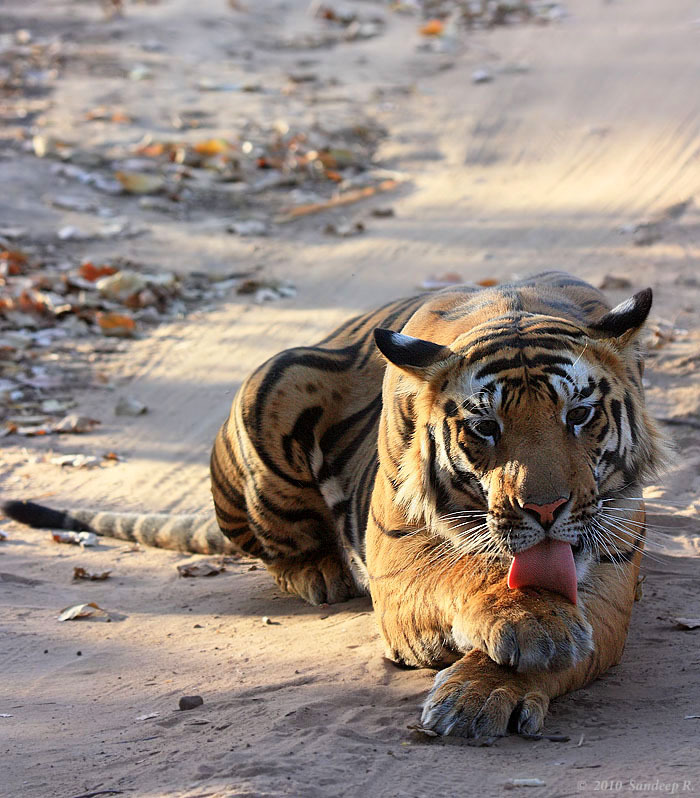 The demand for Tala zone at Bandhavgarh is phenomenal. Entry passes were not only sold out, but also were being sold in black. We didn’t bother, and settled to Magdhi zone. We didn’t expect much action. On the way to Magdhi, we saw pug marks of Mahaman tigress and her cubs. They too wouldn’t be around. But Mohan Singh, our guide, was hopeful. An hour of drive and he yelled ‘Tiger!’. Right in front we saw a huge tigress in the glazing sun. She looked at us and started walking towards us straight. Butch identified her as Suhkipattiya tigress, and told us that she had not been sighted for over a year and was thought to be dead. But there she was pretty woman, walking down the street. The best part was there was no other jeep around. She kept walking straight towards us and we kept reversing the jeep. She scent marked her territory, yawned and continued to walk. It went so for more than 100 meters. 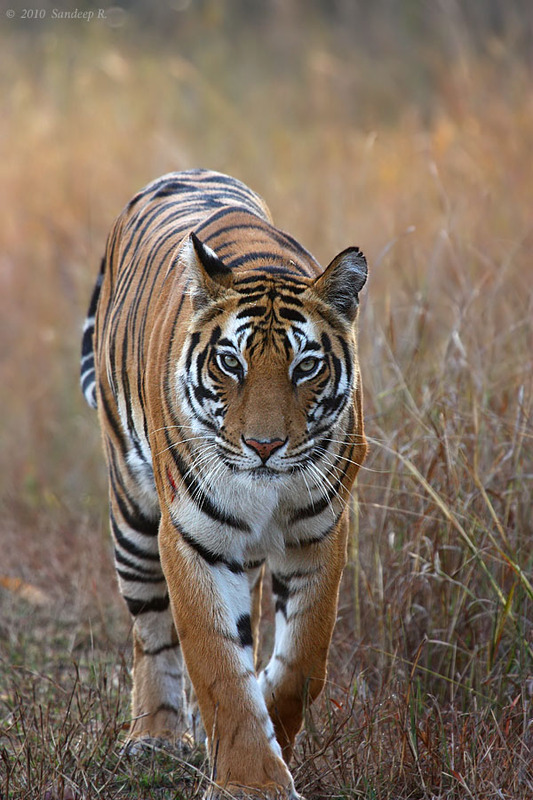 It was an incredible feeling to photograph a huge tiger walking straight at you with eye-contact. After about 15 to 20 minutes, another jeep arrived and she deviated her path. There were a bunch of deer grazing in the meadows, and she started stalking them. Are we gonna see her make a kill?? She stealthily moved towards deer as we watched her. Carefully placing her paws, not to make any noise, she inched closer. I had seen on documentaries tigers placing their paws softly on dried leaves, not to make any noise, and here I saw live in action. But then some of the deer spotted her and gave out alarm calls. Damn it! She was seen here. She sat down as slowly as she could, not to make any noise even if she was seen. Stayed there for few minutes, and disappeared into the bushes. When I look back at my trip that was put in place within a week, I am more than content with the images I have got. 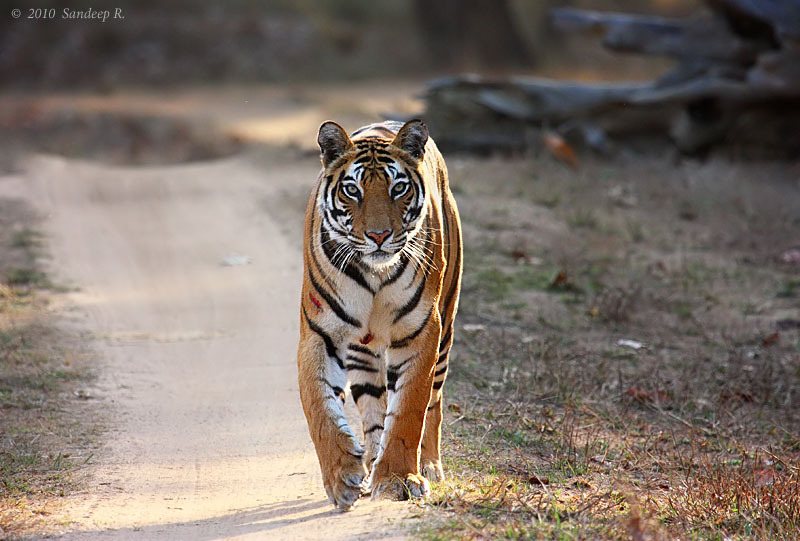 I have higher expectation now, and I’m more than convinced Bandhavgarh is the place for tiger photography. It was very nice of Mukesh to gift me documentary of Temple of tiger and Tiger Kill, both shot at Bandhavgarh. Thanks Mukesh bhai! It was good to meet Dr. Arun Kumar, Arun Rao, Harshad Barve, Himanshu Shenoy, Mukesh Burman, Nihar Mehta, Sanju, Shubh and Tabish Shaikh. Bangalore to Bandhavgarh: (i) Patna-Sbc train from Bangalore to Katni. (ii) Katni to Bandhavgarh in taxi (needs to be booked in advance). Bandhavgarh to Bangalore: (i) Katni to Mumbai in Howrah mail train. (ii) Mumbai to Bangalore in Fly Kingfisher. 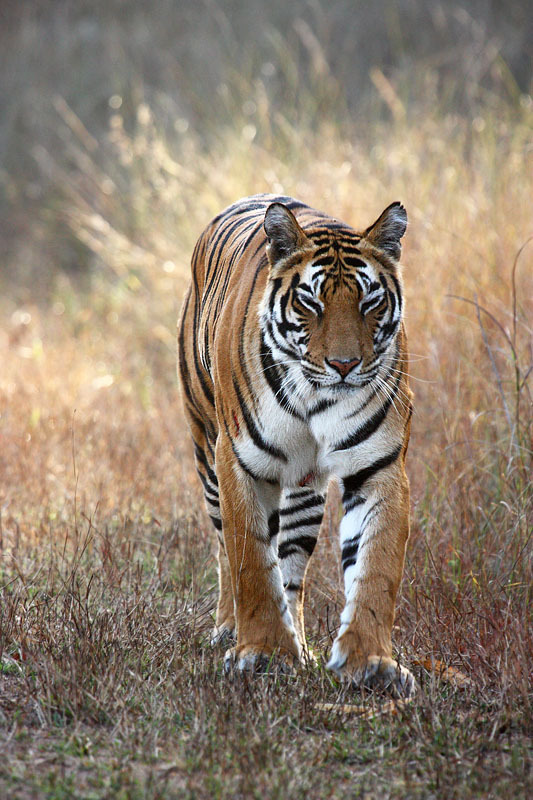 Safaris at Bandhavgarh needs to be booked in advance, particularly for Tala zone. Some resorts/hotels provide safaris along with accommocation. Otherwise, there are many drivers who operate jeeps. P.S. : I changed the design of the blog to accommodate higher resolution images. I am yet to write the CSS completely, I’ve made some basic changes. Let me know if you find anything weird.